We were truly gob-smacked when we were asked by the Premier's Department if we could host a very special dignitary...so important that they could not tell us exactly who at that point in time. 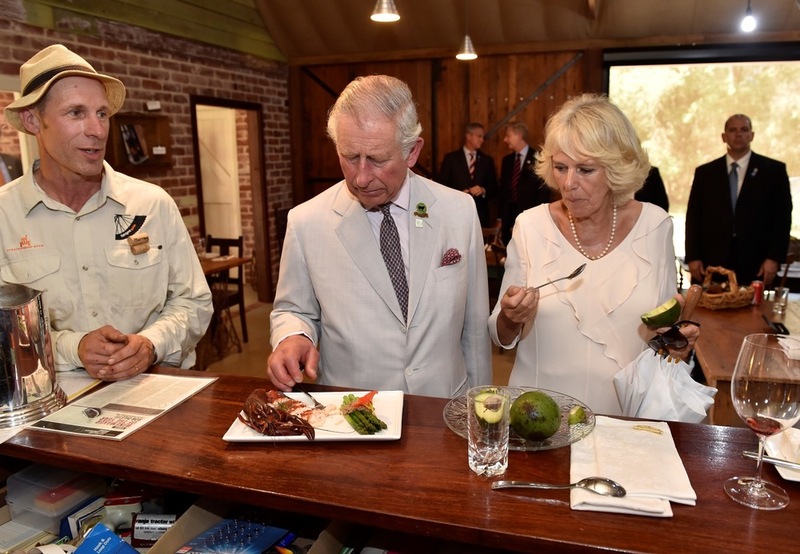 Very soon, it was revealed that none other then His Royal Highness (potential future King of England) Prince Charles and his wife Camilla, the Duchess of Cornwall might select us as a site to make a "private visit" on his Australia-NZ tour of 2015. Not long after an "advanced party" of police, security and other people linked to their Royal Highnesses visited to check us out, we got the nod - a very top secret one at that - that we were the chosen ones. The news was thrilling, but the hard part was keeping it secret. We couldn't even tell Murray's mum! A few weeks before the big event, we were permitted to invite family, friends, helpers, woofers and produce suppliers from the local community. But, only a few! If it had been up to us, there would have been a hundred guests but understandably that wasn't manageable for the Royal entourage. The lucky few seemed almost as thrilled as we were, but one of the most excited was Nicholas - our French ex-woofer - a Michelin-trained pastry chef, who got to cook Prince Charles a beautiful birthday cake (using eggs and lemons from the Oranje Tractor orchard) - HRH's first cake for the day!